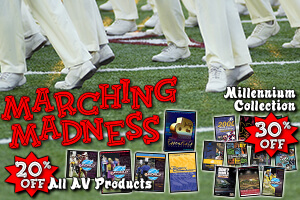 It's Marching Madness at DCIstore.org! For two weeks only, you can save big on Drum Corps International's entire collection of in-stock audio and video products, taking 20% off all CDs, DVDs, and our newest high-definition Blu-ray releases. You can save even more on DCI's popular Millennium Collection, which contains all of the World Championship DVD sets between the years of 2000 and 2009. Normally priced at $399—a savings of more than $60 dollars from buying each DVD individually—get the Millennium Collection this week for 30% off, knocking the price down to just $28 per set. Hurry, this sale will be over after Sunday, March 24! Visit DCIstore.org to view all available products. No coupon code is required. All discounted prices are as marked. Promotion runs Monday, March 11 through Sunday, March 24, 2013. Does not apply to prior purchases or open orders. Drum Corps International reserves the right to modify or cancel promotion at any time.